They’d been waiting for this Austrian Grand Prix, their home race, so very eagerly. Fritz Dorn and his 130-man troop are a special kind of MotoGP fans. Hard-drinking? You bet. But creative too. 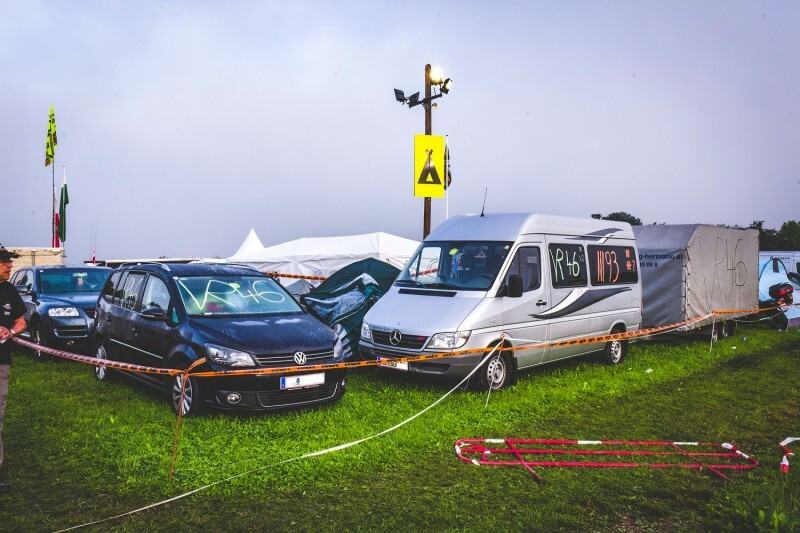 A visit to the campground at the Red Bull Ring. They’ve marked out their territory for these four days, with orange KTM tape. 100 by 200 feet. Right in the middle is a refrigerated cooler, protected with a combination lock. Not everyone knows the code, but Fritz Dorn does. He opens the door, and right away you see it: Beer. Lots of beer. Stacks of Puntigamer and Gösser – Austria’s finest. Fritz pulls out his smartphone and does the math: 2500 liters, 130 guys, so just under 20 liters for each of them. “Should do the trick,” he says. 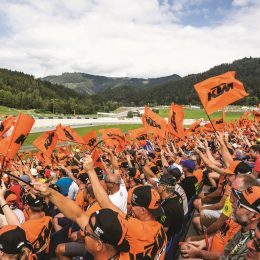 Four days of MotoGP at the Red Bull Ring – and four days they’ve been waiting a long time for. Austria had its last Motorcycle Grand Prix 19 years ago. Now MotoGP is back, and Fritz and his buddies from Hartberg know who they have to thank for this race. Their shirts read “Danke Didi” – a uniquely Austrian “thank you” to Dietrich Mateschitz, who brought the MotoGP here to his Red Bull Ring in Spielberg. Fritz sits down on a case of beer and explains who he’s brought along from Hartberg, his hometown of 6500 people in the eastern part of Austria’s Styria region. From grandson to grandfather, a multigenerational MotoGP outing. First and foremost, the boys from the Silver Bull Riders motorcycle club. And Friedrich Grabner, an Austrian motocross champion from more than 30 years back, is naturally part of the group. Then Fritz points over to six trumpet-shaped metal tubes, mounted on a wooden railing in a tidy row. They connect their chainsaws to it every night, rustic-looking antiques from 1950, and let ‘em rip at full power. “132.8 decibels,” says Fritz. He’s beaming. 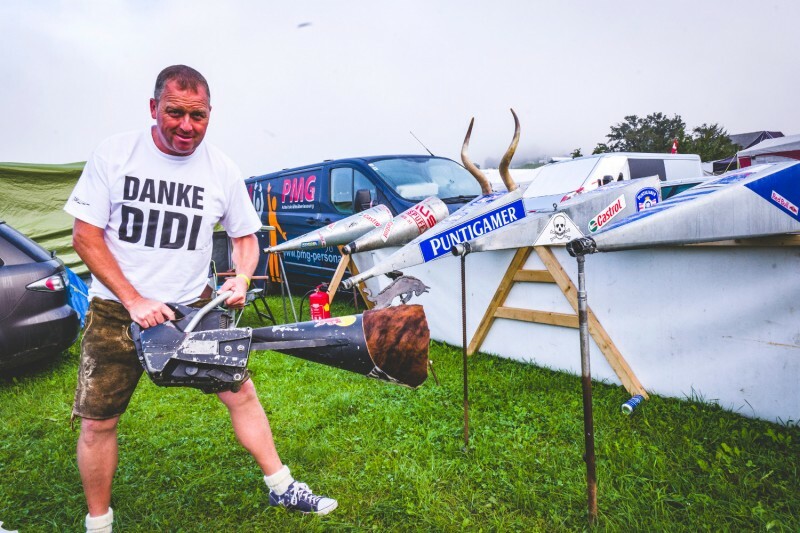 The chainsaw concert is a regular fixture on the MotoGP campgrounds of the world, but no one celebrates it with quite as much dedication as the men from Hartberg. Six men in a row, all in long gray Austrian Gendarmerie raincoats that Fritz bought just for this occasion. Then they light up a Bengal fire fountain, plunging the deafening spectacle into a cloud of yellow smoke. Rossi yellow. “Couldn’t find an orange one,” Fritz says apologetically, since he knows that this article will be appearing in the KTM BLOG. 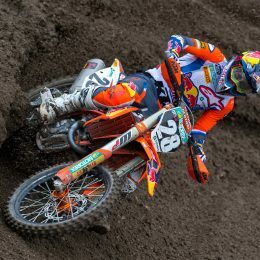 And of course, he and his Hartberg crew are not only patriots, but fiery KTM fans too. Their affection for their homegrown motorcycle manufacturer is reflected in the ten KTM helmets that they’ve put together themselves. Real works of art. The top of the helmet is made from the front panel of a pocket bike, with the matte black look of the KTM MotoGP test bike. Each helmet contains a speaker, through which the original sound of an RC8 can be piped in from a cell phone via Bluetooth. They’ve also built another 21 helmets – one for each of the current MotoGP riders. These also have the pocket bike panel on the top, but each in the colors of the corresponding rider. They’ve even got the original sponsor decals, thanks to a little help from an advertising agency. With their chainsaw concert and their artfully made helmets, the Hartbergers serve as the creative department for the campgrounds around the Red Bull Ring. Meanwhile, Michael Maierhofer has joined Fritz on his throne of beer. He rolls up his sleeves and shows off the body painting on his bicep: the number 58 and the nickname “SIC”, in memory of Marco Simoncelli who was killed in an accident in 2011. And of course, Maierhofer also has the right helmet to go with it. Not only with Simoncelli’s original design, but with a built-in shock of hair as well. The same bushy hair that used to be Simoncelli’s trademark. Simoncelli was an awesome guy, Maierhofer gushes, and holds the helmet up proudly. There’s no doubt about it: If anyone out there is truly crazy for the MotoGP, it’s these guys from Hartberg. In the weeks before the Red Bull Ring Grand Prix, they sent KTM CEO Stefan Pierer an email with pictures of their helmets. 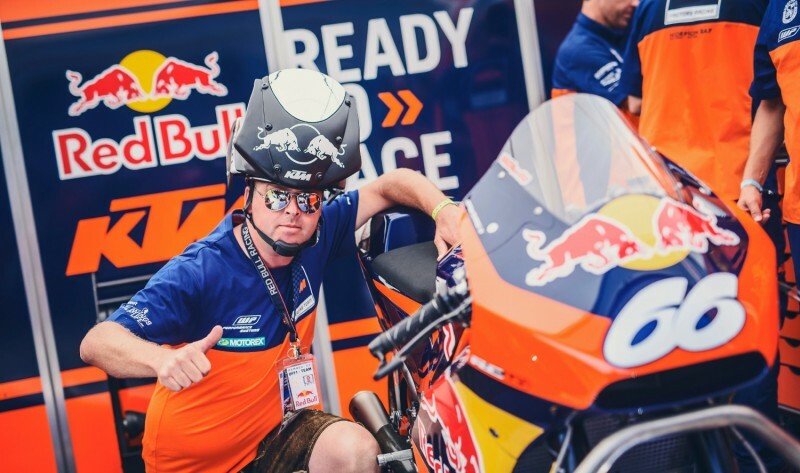 Pierer was impressed, and together with the track operators at Project Spielberg and Red Bull, KTM put them in contact with a range of media contacts. The Austrian station ServusTV showed up, and there were photo shoots here and photo shoots there. In one shoot after the MotoGP qualifying session, Fritz and his colleagues arranged their 21 helmets to reflect the starting grid for the race on Sunday. Then a second, more speculative lineup for the Grand Prix 2017. They were apparently feeling optimistic, because they placed two KTM helmets in the first row of the grid. 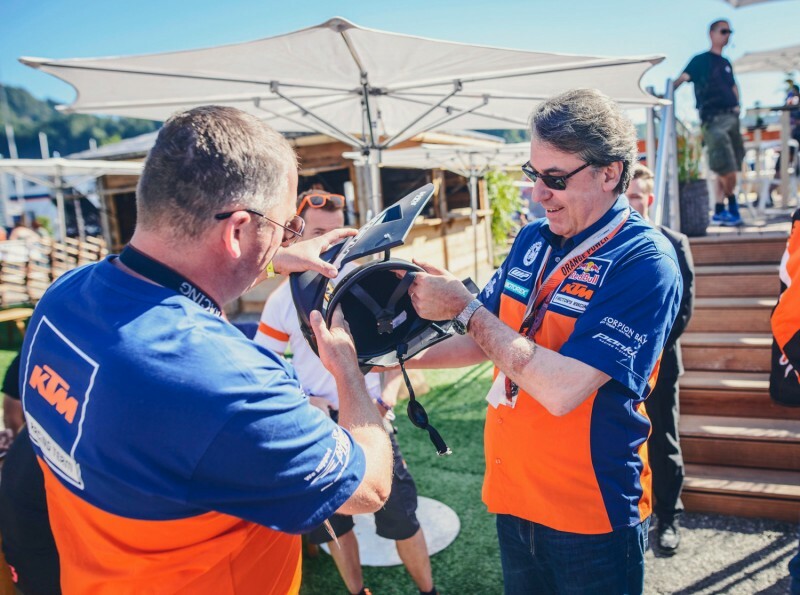 He would be more than happy to give Stefan Pierer one of his handmade KTM helmets. Even though he put dozens of hours of work into each of them. 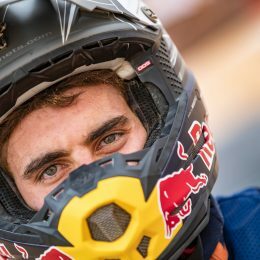 All he wants in return: for Pierer to put a few euros (or maybe more than a few) in his donation box for “Wings for Life”, the Red Bull spinal cord research foundation. The Hartberg crew always has two of those donation boxes on hand, up in the stands and on their travels around the track. Fritz figures he can collect 2000 euros in donations this weekend.